Chris Brumitt, VP Aerospace & Defense and Alfred Baumbusch, EVP Operations Excellence, at Maine Pointe, outline how supply chain collaboration and optimization is the key to unlocking billions of dollars for the military and commercial suppliers alike. What are the challenges facing the military in North America? What are the challenges facing commercial suppliers? 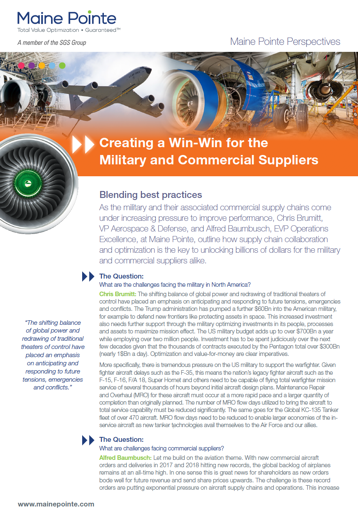 What should the military and commercial suppliers do to overcome these challenges? How can commercial best practice and collaboration be deployed to the benefit of both parties?